At the Our Ocean Conference in Valparaíso, the Chilean President, Michelle Bachelet, announced that her Government is to create one of the world’s largest fully protected marine parks in the waters surrounding Easter Island. At 631,368 square kilometers (243,630 square miles), the new marine park will be the third-largest fully protected area of ocean in the world. The indigenous community of Easter Island—or Rapa Nui, as the island, its indigenous people, and their language are known—proposed the park to safeguard the biodiversity of the island’s waters, which are home to 142 endemic species, 27 of which are threatened or endangered. 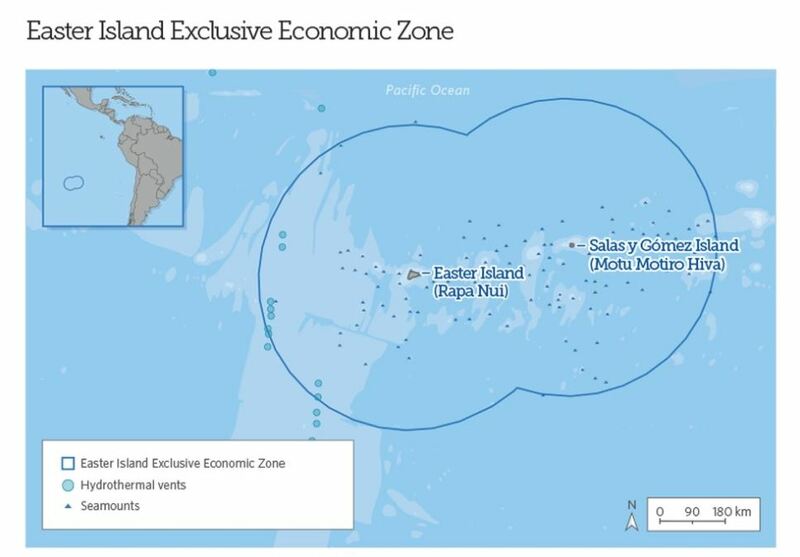 The park also will help the Rapa Nui continue centuries-old subsistence fishing practices within an area that extends 50 nautical miles from the shoreline. The Bertarelli Foundation, in collaboration with Pew’s Global Ocean Legacy program, has supported the Rapa Nui’s efforts to protect their ocean waters since 2012 and also made possible research that underpinned the case for the marine reserve. This included the largest scientific assessment ever completed of the island’s marine environment, an economic analysis of the impact of a marine park, education and training for the local population, the facilitation of cultural exchanges with other native Polynesian people, and assistance with monitoring for illegal fishing activities. This is an exciting breakthrough, and I’m very proud of the role the Foundation has been able to play in supporting the Rapa Nui’s campaign and bringing this about. Rebuilding ocean resilience through protected areas is a crucial contribution to wider ocean health, in addition to securing the unique habitats of Easter Island for future generations. The second Our Ocean conference has just started in Valparaiso, Chile and will hopefully be the the venue for many important ocean-saving announcements. Like the first conference which was held last year in Washington DC, this conference will play host to world leaders, NGOs and philanthropists all with the commitment and vision to help secure a future for the ocean. Dona Bertarelli will be speaking about her support for the Rapa Nui of Easter Island and their campaign to protect the waters around their home. The Bertarelli Foundation has been working with local communities and with the Pew Charitable Trusts to advance their desire to declare a no-take Marine Protected Area around the island – a declaration that would create the largest MPA in the world. The Rapa Nui community has long claimed that foreign vessels are fishing illegally in their waters and local fishermen have reported seeing, what they believe to be, fishing vessel lights in their waters at night; buoys and long line nets, which they don’t use, have often been found washed ashore. The Bertarelli Foundation enlisted the help of SkyTruth, a U.S.-based non-profit organisation specializing in satellite-based remote sensing technologies, to monitor via satellite Easter Island’s waters. Using two different satellite technologies—Automatic Identification System (AIS) and Synthetic Aperture Radar (SAR)—the information collected enabled suspected illegal fishing occurring far out at sea and over a vast area of water to be pinpointed with incredible accuracy. From January to December 2013, they collected information about most of the commercial maritime traffic, including numerous commercial-scale fishing vessels, passing through the more than 700,000 square kilometer marine area that surrounds Easter Island Province. It is believed that this is the first time that these satellite technologies have been combined in this way and used to monitor a country’s waters for illegal fishing activity. With data collected through October 2013, including 163 satellite images, 73 vessels were detected in and around Easter Island’s waters. Of these, 31 were identified using AIS (22 cargo ships, 5 fishing vessels, 1 cruise ship, and 3 undefined). More than half (the remaining 42 vessels) did not identify themselves using AIS, and – based on their size and location – were determined by SkyTruth to be commercial fishing vessels. Twenty-five of these vessels were detected within Easter Island’s Exclusive Economic Zone. The evidence collected so far suggests that unidentified commercial fishing vessels are operating in Easter Island waters, possibly engaged in illegal fishing activity. There is more work to be done to determine the extent of the problem and so the Bertarelli Foundation has committed to a further six months of monitoring in order to further pinpoint when and where possible illegal fishing is occurring in Easter Island’s waters. Like many isolated oceanic island, the waters around Easter Island are particularly vulnerable to the onslaught of illegal fishing activity. Local fishermen have long reported seeing, what they believe to be, fishing vessel lights in their waters at night; buoys and long line nets, not used by Rapa Nui fishermen frequently wash ashore. Keen to help the Rapa Nui protect their waters, the Bertarelli Foundation has partnered with the Pew Charitable Trusts to support a local grass-roots campaign on the island. An analysis commissioned by Pew and the Bertarelli Foundation found Easter Island’s waters to be one of the most unique marine environments in the world. One hundred forty-nine species found here are found nowhere else on earth — that’s more than on the Galapagos Islands. And 27 species listed on the International Union for Conservation of Nature (IUCN) Red List are found there, including the critically endangered southern bluefin tuna. A supporting economic study found that the ocean, and fishing specifically, is an important component of the island’s economy and is a key supporting factor for tourism. fishing data also suggests that recent decades have seen a drop in catch rates, particularly among key local species such as yellowfin tuna and the Easter Island spiny lobster.